Robert De Niro's usually making headlines for his Oscar-winning performances or his culinary prowess, but this week, he's at the center of some fiery news -- literally. 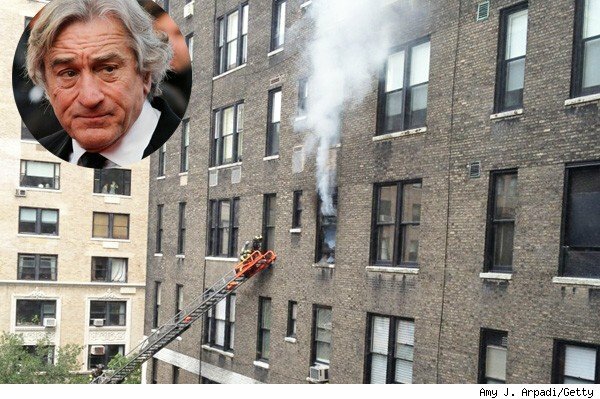 De Niro's fifth-floor New York City apartment caught on fire Friday afternoon -- a blaze which also damaged several floors of the prestigious Brentmore co-op at 88 Central Park West, where homes sell for as much as $25 million. Apparently, the fire erupted due to a lint buildup in the clothes dryer. (Sorry "Goodfellas" and "Godfather II" fans -- no epic, blaze-inducing gunfights here). "I smelled something first, and then I heard the sirens," said Amy J. Arpadi, a tenant who lives across from De Niro's apartment in a neighboring building and who snapped photos of the blaze with her smartphone. "You can't see it in the picture, but there were flames in there. It was a bad fire. The windowsill is still charred, and the windows are now boarded with wood." Luckily, De Niro and his family were out of the country when the blaze erupted. Good thing, because firefighters had difficulty getting water to the blaze due to problems with the building's standpipes. 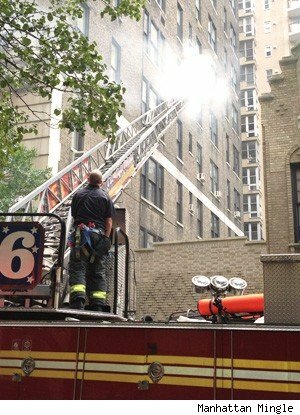 Thankfully, the FDNY told DNAinfo that nobody was injured by the fire. The celebrity-studded building has been home to music greats Sting and Billy Joel, and reportedly was almost the home of Sarah Jessica Parker and Matthew Broderick last year, until they turned down a $21.5 million eight-bedroom pad at the last minute. De Niro himself reportedly paid $23 million for his own 15-room apartment in the building back in 2006. Not that we think a little charring would get him to throw this beauty on the market, but if he did decide to sell, the pad would join a slew of multimillion dollar celebrity homes that are currently for sale, including Michael Jackson's California chateau, Beatle George Harrison's Swiss manor and Amy Winehouse's London apartment.